The most important moments of your life deserve to be remembered in a special way. I create unique artwork that's worthy of your most treasured memories. My REMEMBER the day artwork commemorates your occasions by combining colors and fonts of important dates and words, all on a fine art print or gallery-wrapped canvas background. Hang it in your living room, your child's room, your office - anywhere you can see it and smile. 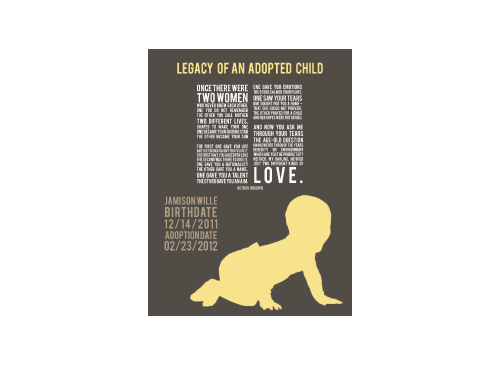 The beautiful poem by unknown, Legacy of an Adopted Child is laid out in beautiful typography along with a silhouette, the child's name, date of birth, and date of adoption. This piece was inspired by a very good friend of mine; she has two adopted boys and her husband was adopted. We created the original version of this for her husband as a Father's Day gift. We all have a certain quote, saying, phrase, or verse that we just love; that speaks to us, provides inspiration, offers comfort, or represents a message to a loved one. With my custom quote product, you have the opportunity to have your favorite quote, saying, phrase, or verse made into a custom piece of art - as either an 8x10" fine art print or as a 12x12x1.5" gallery wrapped canvas. There are four styles to choose from and the text portion of the design is up to you!